The University of Toronto is a public research university in Toronto, Ontario, Canada, situated on the grounds that surround Queen’s Park. It was founded by royal charter in 1827 as King’s College, the first institution of higher learning in Upper Canada. Originally controlled by the Church of England, the university assumed the present name in 1850 upon becoming a secular institution. As a collegiate university, it comprises twelve colleges that differ in character and history which retaining substantial autonomy on financial and institutional affairs. The university grounds lie about 2 kilometres north of the Financial District in Downtown Toronto, and immediately south of the neighbourhoods of Yorkville and The Annex. The site encompasses 71 hectares bounded mostly by Bay Street, Bloor Street, Spadina Avenue and College Street. An enclave surrounded by university grounds, Queen’s Park contains the Ontario Legislative Building and several historic monuments. With its green spaces and many interlocking courtyards, the university forms a distinct region of urban parkland in the city’s downtown core. The namesake University Avenue is a ceremonial boulevard and arterial thoroughfare that runs through downtown between Queen’s Park and Front Street. The Spadina, St. George, Museum, and Queen’s Park stations of the Toronto subway system are located in the vicinity. Developed after the Second World War, the western section of the campus consists mainly of modernist and internationalist structures that contain laboratories and faculty offices. The most significant example of Brutalist architecture is the massive Robarts Library complex, built in 1972 and opened a year later in 1973. It features raised podia, extensive use of triangular geometric designs and a towering fourteen-storey concrete structure that cantilevers above a field of open space and mature trees. Sidney Smith Hall is the home to the Faculty of Arts and Science, as well as a few departments within that faculty. The Leslie L. Dan Pharmacy Building, completed in 2006, exhibits the high-tech architectural style of glass and steel by British architect Norman Foster. The Faculty of Arts and Science is the university’s main undergraduate faculty, and administer most of the courses in the college system. While the colleges are not entirely responsible for teaching duties, most of them house specialized academic programs and lecture series. Among other subjects, Trinity College is associated with programs in international relations, as are University College with Canadian studies, Victoria College with Renaissance studies, Innis College with film studies, New College with gender studies, Woodsworth College with industrial relations and St. Michael’s College with Medievalism. The faculty teaches undergraduate commerce in collaboration with the Rotman School of Management. The Faculty of Applied Science and Engineering is the other major direct-entry undergraduate faculty. The Faculty of Medicine is affiliated with a network of ten teaching hospitals, providing medical treatment, research and advisory services to patients and clients from Canada and abroad. A core member of the network is University Health Network, itself a specialized federation of Toronto General Hospital, Princess Margaret Cancer Centre, Toronto Western Hospital, and Toronto Rehabilitation Institute. Physicians in the medical institutes have cross-appointments to faculty and supervisory positions in university departments. The Rotman School of Management developed the discipline and methodology of integrative thinking, upon which the school bases its curriculum. Founded in 1887, the Faculty of Law’s emphasis on formal teachings of liberal arts and legal theory was then considered unconventional, but gradually helped shift the country’s legal education system away from the apprenticeship model that prevailed until the mid-20th century. The Ontario Institute for Studies in Education is the teachers college of the university, affiliated with its two laboratory schools, the Institute of Child Study and the University of Toronto Schools. Autonomous institutes at the university include the Canadian Institute for Theoretical Astrophysics, the Pontifical Institute of Mediaeval Studies and the Fields Institute. The University of Toronto Libraries is the third-largest academic library system in North America, following those of Harvard and Yale, measured by number of volumes held. The collections include more than 10 million bound volumes, 5.4 million microfilms, 70,000 serial titles and 1 million maps, films, graphics and sound recordings. The largest of the libraries, Robarts Library, holds about five million bound volumes that form the main collection for humanities and social sciences. The Thomas Fisher Rare Book Library constitutes one of the largest repositories of publicly accessible rare books and manuscripts. Its collections range from ancient Egyptian papyri to incunabula and libretti. 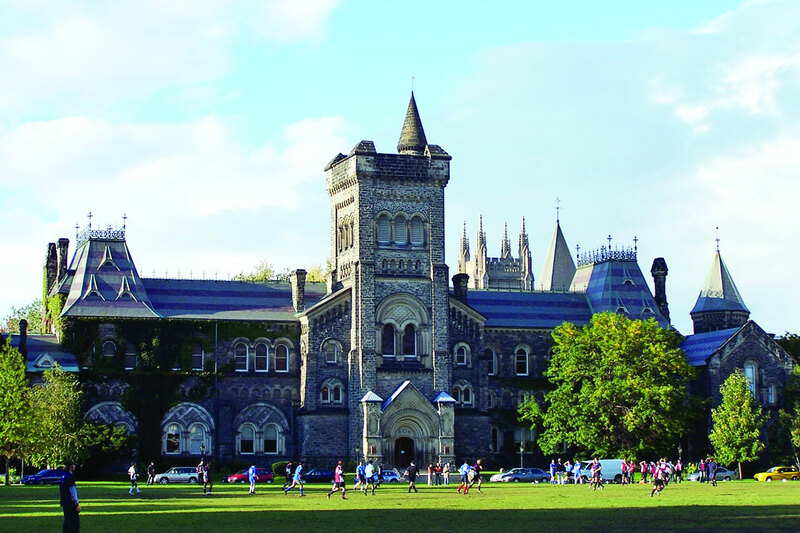 The Times Higher Education World University Rankings of 2013-2014 ranks the University of Toronto at 20th place globally and 1st in Canada, and 16th place globally based on reputation for 2013, while the QS World University Rankings of 2013 place the university at 17th in the world. In the Academic Ranking of World Universities of 2014, the University of Toronto is placed at 24th in the world and 1st in Canada. It ranked 25th worldwide in the 2012 report compiled by Human Resources & Labor Review on graduate performance, 9th worldwide in the 2010 Performance Ranking of Scientific Papers for World Universities, 14th in the High Impact Universities ranking, 14th in a New York Times employment survey in 2013, and 2nd globally in the University Ranking by Academic Performance of 2012. In 2011, the university received a grade of A- for environmental sustainability from the Sustainable Endowments Institute. The university has placed first among Canada’s research universities in the annual ranking by Research Infosource since 2001. In 2011, the University of Toronto was named by Newsweek as one of the top three schools outside of the United States. Since 1926, the University of Toronto has been a member of the Association of American Universities, a consortium of the leading North American research universities. The university manages by far the largest annual research budget of any university in Canada, with sponsored direct-cost expenditures of $878 million in 2010. The federal government was the largest source of funding, with grants from the Canadian Institutes of Health Research, the Natural Sciences and Engineering Research Council and the Social Sciences and Humanities Research Council amounting to about one-third of the research budget. About eight percent of research funding came from corporations, mostly in the health care industry. In addition to Havelock, Innis, Frye, Carpenter and McLuhan, former professors of the past century include Frederick Banting, Harold Scott MacDonald Coxeter, Robertson Davies, John Charles Fields, Leopold Infeld and C. B. Macpherson. Ten Nobel laureates studied or taught at the University of Toronto.